This fragment, attributed to Heraclitus, is generally considered to mean something rather abstract such as: war is everywhere and strife is justice and all that is arises and passes away because of strife. Here, I have deliberately transliterated (instead of translated) πόλεμος, and left δίκη as δίκη – because both πόλεμος and δίκη (written Πόλεμος and, I suggest, Δίκα) should be regarded, like ψυχή (psyche/Psyche) as terms or as principles in their own right (hence the capitalization), and thus imply, suggest, and require, interpretation and explanation, something especially true, in my opinion, regarding Δίκα. To render them blandly by English terms such as ‘war’ and ‘justice’ – which have their own now particular meaning(s) – is in my view erroneous and somewhat lackadaisical. δίκη for instance could be, depending on context: the custom(s) of a folk, judgement (or Judgement personified), the natural and the necessary balance, the correct/customary/ancestral way, and so on. In respect of Δίκα, I write it thus to intimate a new, a particular and numinous, philosophical principle, and differentiate it from the more general δίκη. As a numinous principle, or axiom, Δίκα thus suggests what lies beyond and what was the genesis of δίκη personified as the goddess, Judgement – the goddess of natural balance, of the ancestral way and ancestral customs. That is, when ἔρις (discord) is or becomes δίκη – as suggested by Heraclitus in Fragment 80. 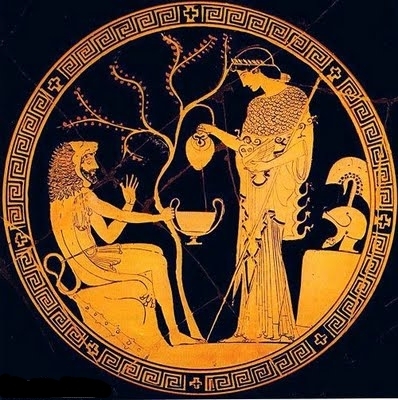 In respect of Πόλεμος, it is perhaps interesting that in the recounted tales of Greek mythology attributed to Aesop, and in circulation at the time of Heraclitus, a personified πόλεμος (as the δαίμων of kindred strife) married a personified ὕβρις (as the δαίμων of arrogant pride)  and that it was a common folk belief that πόλεμος accompanied ὕβρις – that is, that Polemos followed Hubris around rather than vice versa, causing or bringing ἔρις. Therefore one can perhaps understand and appreciate the true and acausal nature of Πόλεμος which, as suggested by Fragment 53, is a natural principle (or ‘energy’ or a manifestation of Being) which affects, or governs, all mortals and which, as suggested by Fragment 80, causes the manifestation of beings from Being (the causal separation of beings) and which natural separation results in ἔρις and thence, as suggested by Fragment 123  a return to Being; a return which can result, as suggested by Fragment 112  arise from thoughtful reasoning [σωφρονεῖν] – and which thoughtful, balanced, reasoning can incline us toward not committing ὕβρις. For the axiom of acausality, see my Introduction to The Philosophy of The Numen. For an outline of opposites, refer to my essay The Abstraction of Change as Opposites and Dialectic. Furthermore, Polemos was originally the δαίμων of kindred strife, whether familial, or of one’s πόλις (one’s clan and their places of dwelling). Thus, to describe Polemos, as is sometimes done, as the god of conflict (or war), is doubly incorrect. Φύσις κρύπτεσθαι φιλεῖ – Concealment accompanies Physis. See my Physis, Nature, Concealment, and Natural Change. For this fragment, see my essay The Balance of Physis – Notes on λόγος and ἀληθέα in Heraclitus.